It’s here! The amazing produce we wait all year for. My garden is full yet I can’t help myself from buying more at the Farmers Markets. I let my imagination run wild and create new recipes. 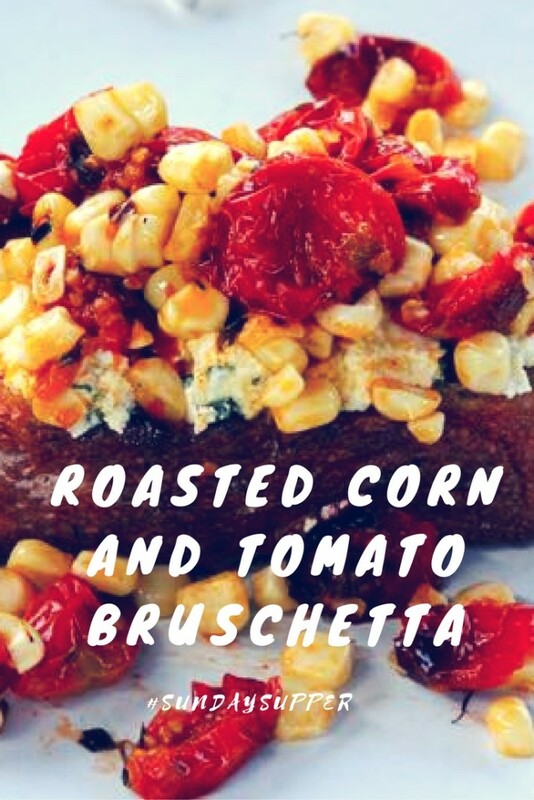 Todays project was one to write home about: Roasted Corn and Tomato Bruschetta. This dish combines everything I love about the summer: fresh in season ingredients, a gorgeous slab of bread, cheese and olive oil. It is so simple yet sooo good. 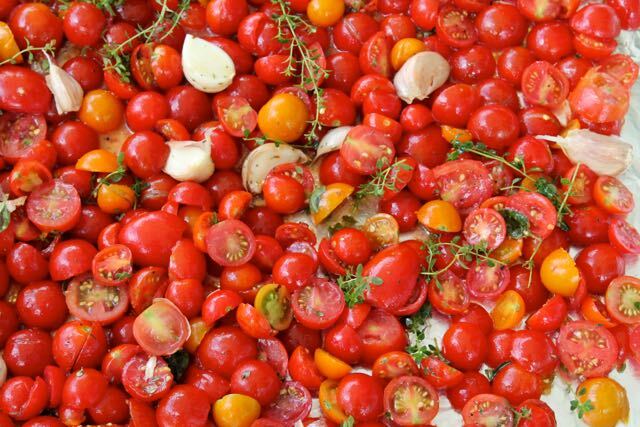 Every year I have a surplus of tomatoes and I roast them with garlic and herbs, whiz them into a sauce and freeze it. This is our go to pizza and pasta sauce that gets us through the winter. 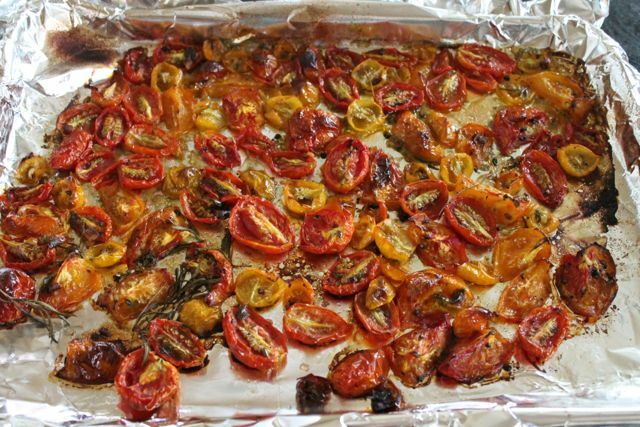 Usually I make my bruschetta out of fresh tomatoes but this time I couldn’t resist the tray of freshly roasted tomatoes and garlic cooling on the counter. 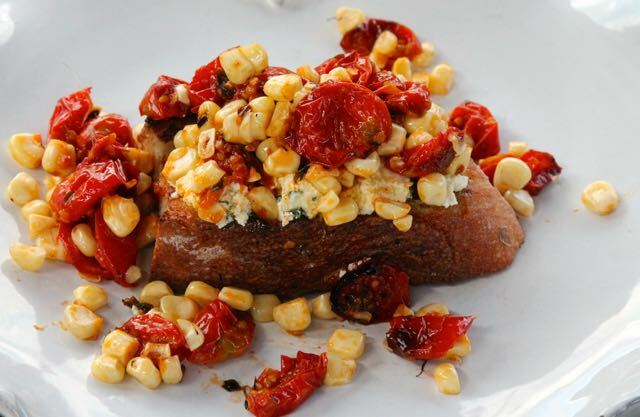 I mixed some chopped basil and olive oil into the ricotta cheese to loosen it up grilled the bread and corn to add to the tomatoes. This is technically an appetizer but I happily ate it for dinner. Maybe that’s what I’ll have again tonight! In a small bowl mix the ricotta cheese with 1 tablespoon of chopped basil and a tablespoon of olive oil, season to taste with salt and pepper. Set aside. 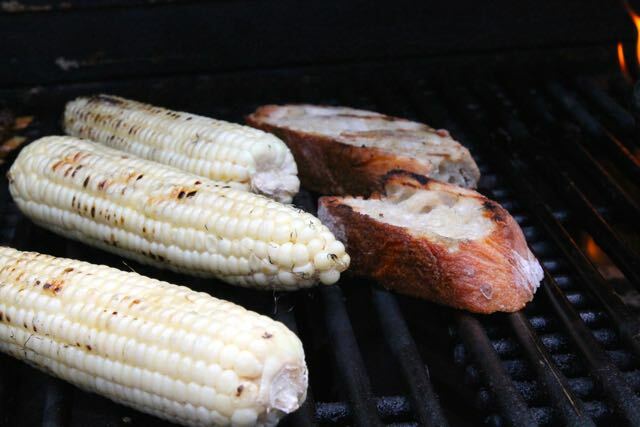 Light a gas or charcoal grill and once it heats up bush the corn and with the olive oil and roast on the grill for 10- 15 minutes until the corn is done and it has a few blackened spots on it. Remove the corn from the grill and let it cool. Slice the kernels form the corn and mix it with the roasted tomatoes and one tablespoon of the chopped basil in a small bowl. Season with salt and pepper to taste and add a few drops of olive oil if the mixture seems dry. Brush the bread with the olive oil and grill it for 2 minutes per side until it is toasted and golden brown. 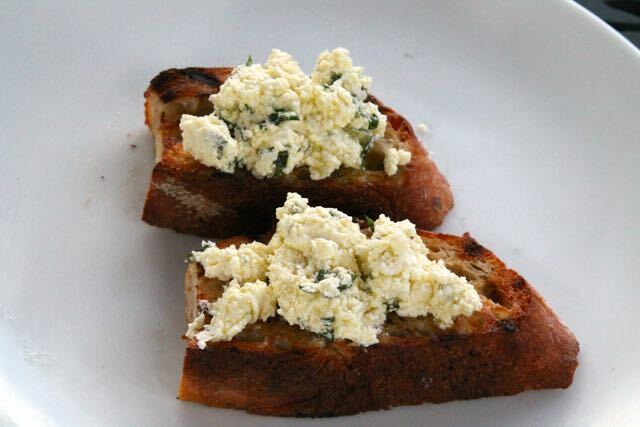 Remove from the heat and spread one side of the toasted bread with a roasted garlic clove. 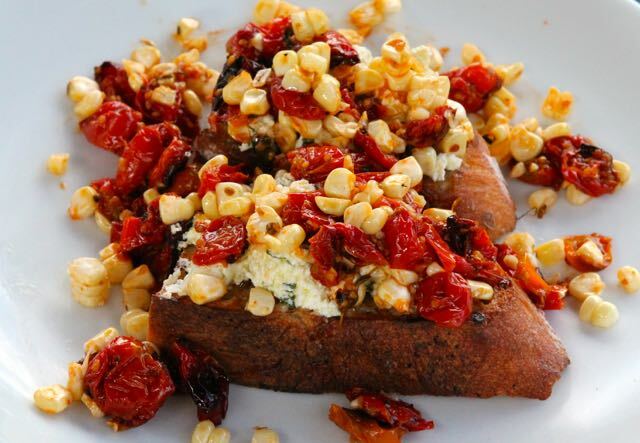 Divide the ricotta mixture between the four slices and top with the roasted corn and tomato mixture. Sprinkle with the remaining tablespoon of chopped basil and serve immediately. 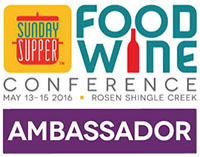 Special Thanks to our amazing host Ellen Folkman from Family Around the Table! 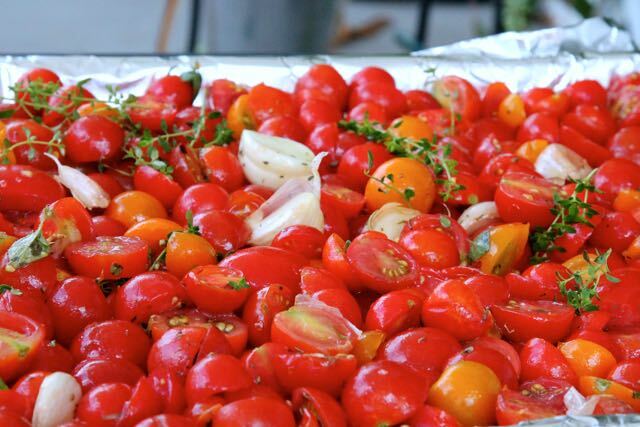 I love, love this bruschetta topping! I’m hosting a dinner party at the end of the month and this would be a wonderful appetizer! This is so perfect for summer! All of the flavors sound so wonderful together! What a wonderful topping combo! My family would gobble this up! Monica, you have outdone yourself with this wonderful topping. I can imagine your friends and family loving it. A great idea for a small plates party! Beautiful Monica! I could eat this and only this for dinner with a couple of glasses of good wine! Summertime at it’s best! A perfect celebration of the season! This would qualify as a dinner in my book, too! My husband would disagree, but now I have options when he’s on travel. Ohhh my gosh. I am pretty sure each and every once of these ingredients is on my all time favorites list!! !